Once I got up this morning and had shared a pot of coffee with EJ, I spent the morning making homemade bread and homemade pizza. Last night JJ had said he was hungry for both and because his appetite has been wonky since his cancer treatment, I try to make him anything he says he is hungry for in order to entice him to eat. We haven’t yet sliced into the bread, but JJ said the pizza was yummy. Yay! While the bread was rising, I went outside to put up the new wren birdhouse that EJ bought me. At first I was going to put it in the peony garden so we could see it from the east living room window, but then I decided that it was too close to the front porch where the outside cats spend most of their time. I was afraid that when baby birds took their first flight, they’d be easy prey for Annie. Then I thought I’d set the birdhouse near the birdfeeders, but was afraid that I’d disturb the birds whenever I went out to fill the feeders. So I finally decided to put it out in the flower garden next to the herb garden. Although I won’t be able to watch its inhabitants when I’m sitting in the living room, I will be able to clearly see it when sitting at the kitchen table. After EJ left for work, I took Danny for his daily walk. I thought the temperatures had felt cooler this morning, but by the time I finished our walk I was melting again. When we got home, I put on a jacket and my bug net hat as protection against vile mosquitoes and went out to weed the strawberry patch and pick ripe strawberries. My strawberry patch is still pretty small so I only get a couple handfuls at a time. I freeze them so they don’t rot before I can accumulate enough to make something yummy. My mosquito protection worked, but by the time I was finished with the strawberry patch, I was overheated and melting even more. I sat in front of a fan for a while to cool off. My cinnamon sticks and my electric coffee grinder. 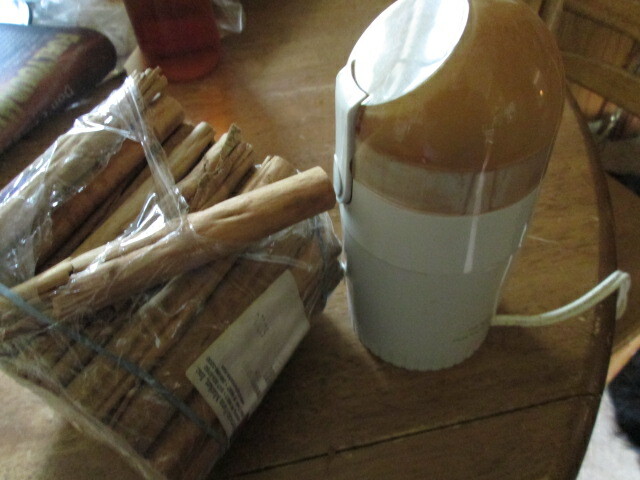 I spent several hours this afternoon grinding cinnamon sticks into powder with my electric coffee grinder. I use the electric grinder for spices such as cinnamon, ginger, and cloves, which I buy at the farm market-ish store. 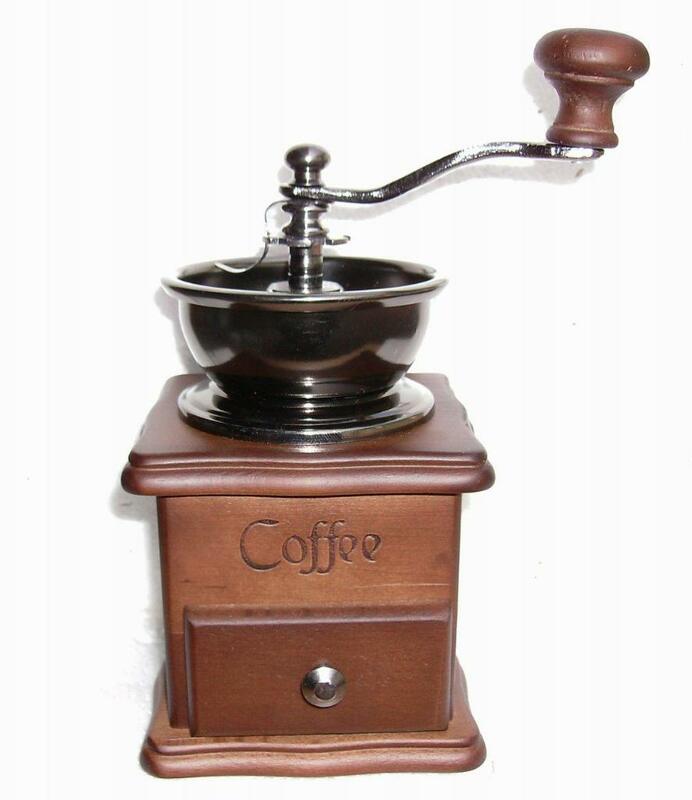 When I have coffee beans, I grind them with an old fashioned coffee grinder. I ground up all the cinnamon sticks and ended up with a large jar of cinnamon powder that should last me a very long time. That is good because I LOVE cinnamon. While I sat at the kitchen table grinding the cinnamon sticks, I enjoyed watching the wrens building their nest in the birdhouse condo. So far the sparrows haven’t kicked them out. 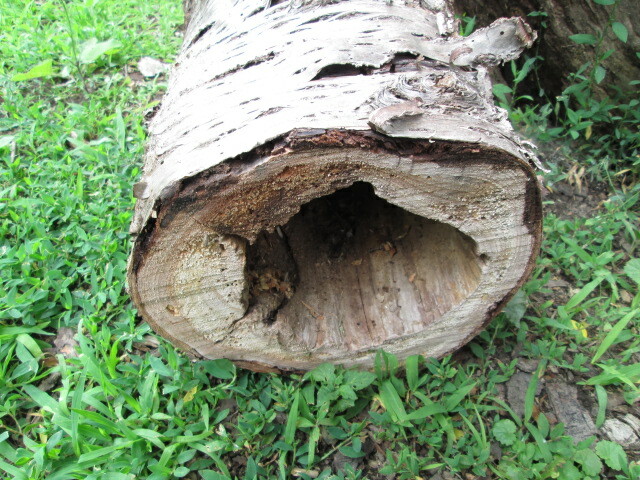 After EJ read my blog post last night, he said we could easily make toad houses with the two or three hollow logs that were in the load of firewood a friend gave us a few months ago. Ever since he first saw them, EJ has been saying that we ought to be able to use them–maybe as a planter or something. He wasn’t sure exactly. But last night he said they’d make dandy toad houses. We could partially bury them as the article suggested. I thought his idea was spendiferous. I will have to consider where to place them. Obviously I will have to put them where the slugs are so I can attract the toads there for a yummy meal. I have been focusing on birdscaping my yard–making my yard attractive to birds. Now, apparently, I have branched out into toadscaping as well. By the way, yesterday I wrote about panicking when JJ told me there was a bug on me. I want to tell you that even though I hated bugs on me, I didn’t want JJ to be afraid of them too so when he was little, I took him on “bug hunts.” We’d sit and watch a colony of swarming ants, or overturn rocks to see what was underneath. We admired the leftover skins of cicadas or the beautifully woven spider webs. One time we watched a praying mantis lay eggs on our house. We researched unfamiliar bugs so we could learn about them. Neighbor kids also joined us on our bug hunts. None of the kids knew that I was scared of bugs until one day one of them told me that there was a bug on me. I did the “Get it off!” dance and then looked up to see a row of children looking at me with their mouths opened in shock. So I confessed to them that I thought bugs were interesting until they were on me. LOL.